Opium, Corruption, and Govt: A Smoothly Run Machine. Most government functions in Afghanistan simply do not work well. Whether it is the military, health services, police, education, or any other aspect of Afghan government at the national, provincial, and district level - there are problems with corruption, ineptness, and more. However, there is one aspect of Afghan society that seems to work well - that is the joining of government officials, drug traffickers, and others in ensuring that the opium gets to market - providing income and profits to many. Read more in "Tasked With Combating Opium, Afghan Officials Profit From It", The New York Times, February 15, 2016. Taliban as a Drug Cartel. Recently the Taliban 'shadow governor' of Nimruz province (adjacent to the troubled Helmand province) was captured by Afghan special police (444) transporting nearly a metric ton of opium across the southwestern Afghan desert. The event highlights how much the Taliban and drug trade are intertwined in southwest Afghanistan. Read more in a news report by Azam Ahmed entitled "Penetrating Every Stage of Afghan Opium Chain, Taliban Become a Cartel", The New York Times, February 16, 2016. Legalize Opium? 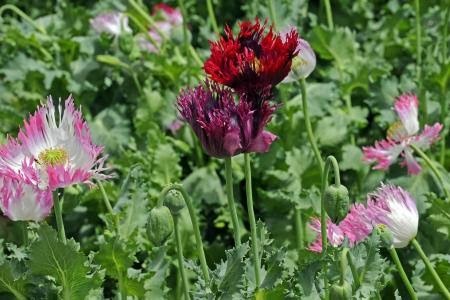 One writer, Jeffrey Miron, shares his thoughts on the opium trade in "Opium Prohibition in Afghanistan", CATO Institute, February 16, 2016. Drugs in Nangarhar. This province has historically been one of the more important ones - with a road that travels from Pakistan to Kabul (east-west). However, it has lots of problems with security. The Taliban are present as well as the newly-established Islamic State. And, of course, there is the drug problem. Read The Devil is in the Details: Nangarhar's continued decline into insurgency, violence and widespread drug production, Afghanistan Research and Evaluation Unit (AREU), February 2016. Islamic Terrorism & Drug Money. The Taliban is not the only organization using drug money to finance operations. The Islamic State or ISIS depends heavily on drug money to fund its operations as well. Read more in "There's a little-known connection between Islamic terrorism and drug money", Business Insider, February 17, 2016.